Searching for promising low-priced stocks? Here are two companies with strong long-term growth potential that are worth considering. If you're searching for a low-priced stock that has strong growth potential, two priced at under $10 per share as of Oct. 18 that deserve consideration are Companhia de Saneamento Basico do Estado de Sao Paulo (NYSE:SBS), known as Sabesp, and Sirius XM Holdings (NASDAQ:SIRI). Keep in mind that "low-priced" does not equate to "cheap." Price per share has nothing to do with how attractively valued a stock is relative to its fundamentals and growth prospects. Moreover, the lower-priced stock space tends to be quite risky. It's filled with stocks of companies that are relatively new and untested, stuck in low-growth mode, or in industries that have been beaten down due to macroeconomic or other factors. However, here are two potential long-term winners, though both have their risks, as well. Sabesp provides water and wastewater services in Sao Paulo, Brazil. It's been an especially volatile stock in recent years and has lagged the S&P 500 over the 10-year period, as the preceding chart shows. It has, however, cruised to a 122% total return over the one-year period through Oct. 13, crushing the broader market's 8.8% return. The seismic waves in Sabesp's stock chart reflect its financial performance swings that have been largely due to its Brazilian location. The country has frequent water-supply concerns due to droughts, has been mired in political turmoil, and has a currency that in recent years has spiked and plummeted in value relative to the U.S. dollar. So why do I suggest Sabesp is worth considering? First, the severe drought in its service territory, which has hurt its financial results, has recently begun to ease. Second, analysts expect its earnings per share to increase at a brisk average annual rate of 35.1% over the next five years. Lastly, its financials have received a big boost from the partial recovery in 2016 of the value of the Brazilian real relative to the U.S. dollar. Sabesp's valuation based on both earnings and free cash flow (FCF) is attractive. Its price-to-earnings ratio for the trailing 12 months is 19.4, which is low given its projected growth. Its price-to-FCF ratio is 22.8, reflecting a solid free cash flow in an industry where most companies struggle to generate a positive FCF. 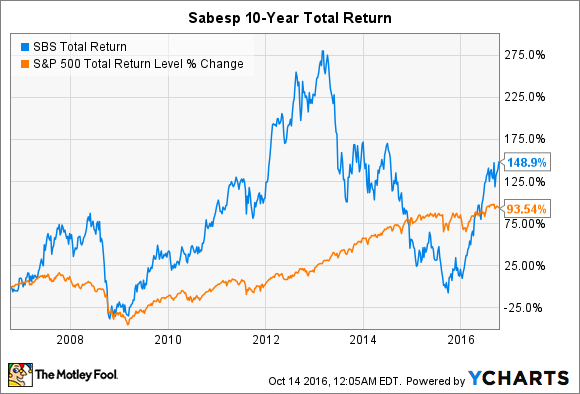 The low valuation metrics stem from the risk entailed in investing in Sabesp. But it's a stock worth considering if you're an investor with a higher risk tolerance who is willing to keep up on exchange rates and the drought and political situations in Brazil. Image source: Sirius XM Holdings. Sirius XM Holdings -- or Sirius XM Radio, as it was formerly known -- is a satellite radio company. It's the world's largest radio company measured by revenue and has more than 30 million subscribers. We're not talking about your mother's radio. Sirius XM is a leading provider of connected vehicle services to major automakers, which provides consumers with a suite of safety, security, and convenience services. In addition, its services are available on aircraft and boats, and on smartphones and other connected devices, as well as online. Consumers have numerous audio entertainment and information options these days, but Sirius XM has a lock on the satellite space. Its strong competitive position is reflected in the fact that it's been able to successfully increase its prices modestly without any notable balking or bailing from subscribers. And, in fact, Sirius continues to experience solid growth in subscriber count. It expects to add 1.6 million net new self-pay subscribers and 1.7 million total net new subscribers in 2016, which amounts to annual growth of more than 5%. 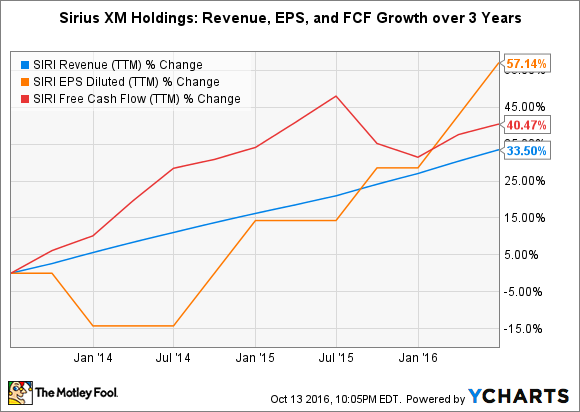 Unlike many low-priced stocks, Sirius XM has experienced nice growth in the key financial metrics of revenue, earnings per share, and free cash flow over the last few years. Notably, Sirius' EPS has increased faster than its revenue over the last three years, which means its profit margin has expanded. Moreover, the company spews out cash, as its FCF has also been growing faster than revenue. Sirius' stock is priced at 37.6 times trailing-12-month earnings and 28.7 times forward earnings. While these are fairly hefty valuation metrics, the company's P/FCF is a more compelling 18.1. The main risk factor to watch is the potential for streaming services to take a bite out of the company's business. Sirius XM Holdings' CEO Jim Meyer has said as recently as August that the company sees "zero impact" from streamers; however, investors should monitor this factor.